New Production: Barcelona’s Liceu and Welsh National Opera. Count Almaviva: Ludovic Tézier/ David Menéndez. Countess Almaviva: Emma Bell/Maite Alberola. Don Bartolo: Friedemann Röhling/Josep Ribot. During the last few years Mozart has become a familiar composer at Barcelona’s Liceu. In fact there is always at least one of his operas in every season. Last year there was Don Giovanni, while in the years before we had La Clemenza di Tito, Idomeneo, The Magic Flute and Cosí Fan Tutte. 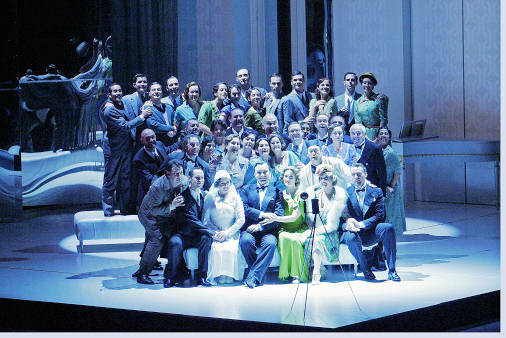 This year it is the turn of Le Nozze di Figaro, last performed in Barcelona in 1999. This new production has stage by the Catalan Lluis Pasqual, who changes the action to the 1930s and has taken dance as the opera’s true leitmotiv - actually to the point where the opera could be easily called Le Dance de Figaro. This Mozart opera was the composer’s first collaboration with Lorenzo Da Ponte and is of course based on Beaumarchais’ La Folle Journée or Le Mariage de Figaro. I mention that because French writer sets the drama in a very precise time, at the end of the Ancien Regime, where the work’s story makes real sense, contrasting the servitude of Figaro and Susanna with the nobles and their privileges. Pasqual considers that the action does not need any specific time-frame, which to my mind is more than debatable at the very least. I remember Kaspar Bech Holten’s production in Vienna which transfers the action to modern times, and yeat came over as one of the most hilarious works I have ever seen on stage. No such luck with Mr. Pasqual although he is remarkable when directing the singers. Following through the concept of dance he changes the third act Fandango into an authentic collective dance, although without the elegance and brightness that José Luis Castro offered years ago in his production of Figaro. The sets are attractive in pale colours, while the garden scene consists only of moving glass panels. For my taste, the best parts of the production are the costumes by Franca Squarciapino. Another Catalan, the veteran conductore Antoni Ros-Marbá, was in charge of the musical direction. In my experience with Le Nozze di Figaro the interpretation of the overture predicts perfectly what the rest of the opera will be like and this was exactly the case here. A slow overture with no trace of liveliness or joy moved into a rather flat, lifeless and mostly boring performance. Maestro Ros Marbá is an experienced conductor, one of the most renowned in Spain, but comedy seems not to be his natural territory. The orchestra was not at its best either with some clamorous failures by the horns. The chorus was at its usual high level in all of its brief appearences. There were two different casts and the second one was an almost wholly Spanish cast, as also happened a few years ago in Oviedo with this opera. The Figaro in the first cast was the American bass baritone Kyle Ketelsen, who returned to Barcelona after singing Leporello last summer and who proved again that he is a very good singer, with an attractive and sonorous voice, as well as being a good actor In the second cast we had Joan Martin-Royo, who was not quite good enough in purely vocal terms. His interpretation of the valet character was extraordinary however, one of the best to be seen anywhere, but his light voice and inadequate projection remains a serious handicap. The first Susanna was Ofelia Sala, who produced a good performance. Her voice is attractive, but it is rather too small for a large theater like the Liceu. She was a little short on joy and vivacity too. Much better was Ainhoa Garmendia, who gave a wonderful interpretation in every sense. This role fits her like a glove, since it is not demanding in the high notes, which are Ms. Garmendia true weakness. She dominated the stage and it was more than evident that she was enjoying herself. In fact this was by far the best performance I have ever seen from this soprano. Emma Bell was a decent Countess, although her voice lacks some roundness. She was at her best in the recitatives, which were sung with much intensity. Her “Porgi amor” was not too exciting, but she was genuinely excellent in the middle part of “Dove Sono”, where she showed a truly beautiful mezza voce, whereas both the first and final sections of the aria were too loud. Maite Alberola exhibited a voice well suited to the role in the second cast, although to be a great interpreter of this character a vocal beauty and a homogeneity of registers is needed which on this showing, she does not have. Again, she was much better in “Dove Sono” than in “Porgi amor”. Ludovic Tézier was a splendid Count Almaviva. This excellent French baritone is today among the best in this role and in many other lyric characters too. His is a beautiful baritone and he was also very convincing interpreter. In contrast, the Asturian David Menéndez was a distinctly pallid alternative,mostly convincing as an actor. His voice lacks the volume and beauty for such an important role. The French mezzosoprano Sophie Koch was a lively Cherubino. She is a most interesting artist and was also an outstanding interpreter, particularly in “Voi, Che sapete”. Jossie Perez was not at the same level in the second cast, failing to win applause for any of her arias. Her voice is pleasant in the middle, but as she moves upwards things change for the worse. I am afraid that the fact of her singing Carmen or Charlotte could well be the reason this problem. Marie McLaughlin sang in both casts, having had to replace local Mercé Obiols in the second one. Marcellina has become a speciality for this Scottish singer and she is a great actress. Friedemann Röhling was a adequate Bartolo, rather light in the middle range and . iIn the second cast Josep Ribot lacked the volume for the role, although he is a good actor. In the secondary parts I must mention the interpretation of the veteran Raul Giménez as Basilio, demonstrating that for a real artist like him there is no such thing as a small role. So it was a pity that the aria from the last act was cut, as usual. Vicente Ombuena was also good in the second cast. There were two attractive Barbarinas. Eliana Bayón in the first cast and Naroa Intxausti in the second. Valeriano Lanchas was a good Antonio and Roger Padulles a not too comical Don Curzio. There was a full house for both performances. In the second cast, the first applause did not happen until ‘Dove sono’ , while in the first cast there was applause after “Non so piú”. At the final bows there were warm receptions for both casts however particularly for Emma Bell, Ludovic Tezier and Ainhoa Garmendia.